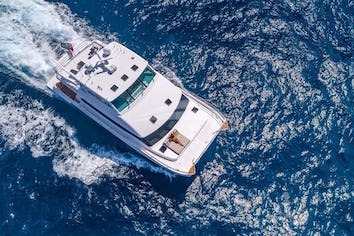 WINDWARD is an extremely practical 3 cabin (plus crew) motor yacht with a brilliant layout. 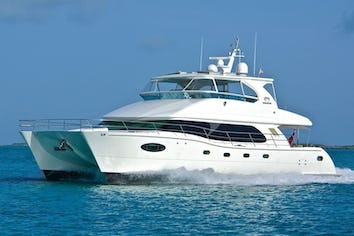 She is in excellent condition and ready to charter! 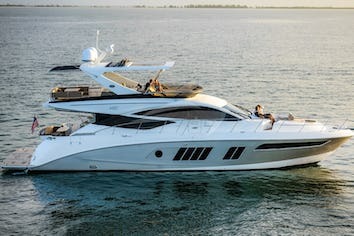 WINDWARD has speed, beauty, and a very functional layout with a large fly bridge, aft deck, salon and entertaining areas. There is a full beam master cabin below plus two large guest cabins amidships (one with queen and one with twin beds). The captain's cabin is located forward of the galley and additional crew quarters are aft with double bunks and separate head and shower. There is an additional v-berth cabin located forward of the galley which will be utilized by crew during charters, or if guests need the double stateroom, the extra crew can take the twin stateroom. This is up for the charter client to decide which layout works best for them. Access to WINDWARD is via large the swim platform or port or starboard gates when docking alongside. The aft deck provides an undercover entertainment area with a Ubench settee and teak table. This area seats 8 - 10 guests for al fresco dining. To port is a wet bar and to starboard is a stairway accessing the fly bridge. Entry to the main salon is through tempered glass sliding doors. The salon has panoramic windows for abundant natural light and roman shades for privacy. There is an entertainment center to starboard in the aft corner. A settee and coffee table are to port. The formal dining area to port was created with columns and a custom dining buffet featuring curved overhead cabinets and granite counter tops. The granite matches the wet bar to starboard which has a Subzero wine cooler, fridge and ice maker, and in wall glass storage. Granite flooring matching the buffet and bar top completes this area. A spiral staircase accessing the Master suite and two guest suites as well as the fly bridge is located just forward of the bar to starboard. The master suite is full beam amidship. There is a king size berth with storage drawers beneath. Walk in closet with cedar lining on aft bulkhead, ample drawer space. There is a his and her bath with vanity on her side with large glass enclosed shower between. Below port side queen stateroom with separate head & shower. Starboard twin stateroom w/ separate head & shower. There is an additional v-berth forward of the galley that is utilized by crew during charter. If the charter client would prefer to use the v-berth, the crew will switch to the twin cabin. The helm station on the fly bridge has full repeat electronics as in the pilothouse. This is a premier entertainment area. There are three Crown helm chairs, bench seating and table. All of this is under the removable hard top that can easily be removed to pass under low bridges. Aft of this area are deck chairs for sunning. The boat deck holds a custom Novurania 430 DL w/ 60hp Yamaha outboard with tow package, canvas cover, wet bar, JenneAir grill & icemaker for entertainment. What a grand experience we enjoyed aboard the Windward. The boat is first class and the crew you put together was even better. You cared for our safety and comfort. You cared for our guests. You exhibited a caring attitude throughout. You are obviously comfortable with responsibility. You wear your authority lightly. And none of us will soon forget the Exumas! As first time travelers you took us to all the best spots, the calmest waters, the most beautiful sunsets. Thank you again for a wonderful sail! Can’t wait to do it all again. Best Regards and Smooth Sailing!